New Jersey hailing artist Rich Quick is a newcomer to this blog, and to a few ears. In April of 2012 Rich Quick released ‘I'm With The DJ’, a mixtape hosted by DJ NoPhrillz and Benja Styles gained an amazing amount of feedback from listeners and fans of the artist. Rich Quick switched it up a bit, and not just delivered any mixtape - but delivered a masterpiece with it - the first 500 physical copies of the mixtape included 1 of 5 limited edition hand drawn hip-hop themed art cards. Rich included the art cards as a testament to hip-hop's influence on art and pop culture. Whilst touring promoting ‘I'm With The DJ’, Rich was fortunate enough to meet Stress the White Boy who is part of a powerhouse production duo alongside Chuck Treece, better referred to as STREECE™, who began working with Rich on an EP titled ‘Sad Songz’ from Ben Frank Recordings - which debuted Top 40 on the iTunes hip hop album charts, the day of it's release. 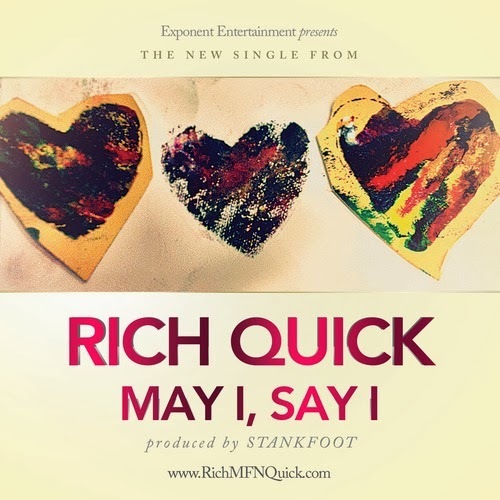 Now in 2014, Rich Quick comes bearing gifts the first of which is ‘May I, Say I’ - a song that one can easily vibe to, and just think about the lyrics of what's being said by the New Jersey rapper. Produced by STANKFOOT, ‘May I, Say I’ shows off Rich Quick's lyrical ability to rap over any beat, and does the job on this chilled out number. where he gives us a poetic flow. ‘May I, Say I’ is assured to have your mouse over the repeat button, as Rich Quick's poetic flow on the track will have you mesmerized in fascination of how he manages to collectively put together such song. Fans of Rich Quick have labelled it as "one of his best songs yet", listen below and find out why..